Celebration time for Coleraine in the 2-0 win over Dungannon Swifts. Pic by INPHO. Coleraine leapfrogged Glenavon into fourth place in the Danske Bank Premiership following a convincing 2-0 win at Dungannon Swifts. The Bannsiders, still smarting from a defeat at the hands of the Swifts a fortnight ago, were determined to make amends at Stangmore Park. And they inflicted the damage in the first half thanks to goals from James McLaughlin and Stevie Lowry. The second half was largely a non-event - with the visitors happy to hold what they had, and the Swifts struggling to find any rhythm. The home side made the early running but they almost presented the Bannsiders with a goal-scoring opportunity on five minutes. Chris Hegarty tried to flick a long ball back to Alex Moore but didn’t get enough contact before slipping and Jamie McGonigle looked set to pounce only to be denied by the alert Swifts keeper. Thirteen minutes proved lucky for the visitors as a swift counter-attack saw McGonigle cross for strike partner James McLaughlin to slide in and loop a finish past Moore. Jamie Glackin forced Moore into a decent stop on his return to his old stomping ground with 20 minutes on the clock. From the resulting corner, Lowry reacted quickest to turn and fire home inside the six-yard box. Coleraine were looking dangerous on the break. Another swift counter on 39 minutes saw McGonigle combine with Glackin but the striker failed to connect with the cross properly and McLaughlin was flagged for offside as he tried to latch on to the loose ball. Into the second half and Paul McElroy latched on to a long punt forward from Moore on 51 minutes, but he cut inside and saw his shot blocked for Dungannon Swifts. New Swifts signing Michael Carvill should have done better when he weaved his way through the Coleraine defence on 54 minutes, but he and McElroy got in each other’s way and Carvill shot straight at Johns. The second half was largely a drab affair with neither side creating many clearcut chances. A superb touch and turn from McGonigle on 78 minutes almost created an opening for the Bannsiders, but David Armstrong managed to nip in and edge the cutback away from the waiting Ben Doherty. The Swifts should have pulled a goal back on 83 minutes as Oisin Smyth teed up Carvill in the box, but the striker fired over the bar. 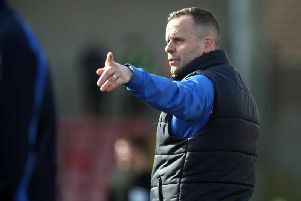 Coleraine could have added a third in stoppage time as Dean Shiels released Cormac Burke, he unleashed a thunderous drive from the edge of the box, which beat Moore but crashed off the bar. Shiels tried to pick out Eoin Bradley with the loose ball, but his cross sailed across the face of goal. Dungannon Swifts: Moore, Hegarty, Armstrong, McElroy, Teggart (Clucas, 46), O’Rourke, Patton (Campbell, 64), Hutchinson (Lafferty, 80), Smyth, Ferrin, Carvill. Subs (not used): Moran, Dykes, McGinty, Gallagher. Coleraine: Johns, Mullan, Lowry, McLaughlin (Shiels, 61), Carson (Burke, 34), McConaghie, McGonigle (Bradley, 79), Doherty, Edgar, Glackin, King. Subs (not used): Doherty, O’Donnell, Parkhill, Davidson.